False! Perhaps the most common myth surrounding phentermine is that anyone can purchase real “(prescription-grade) phentermine online or without having a prescription from a doctor. That’s simply not true. The main active ingredient in prescription phentermine is phentermine HCL. This chemical compound has a similar makeup to amphetamines. Given the strength and addictive potential of phentermine HCL, the FDA classifies it as a controlled substance. This is why it is impossible to purchase “real” phentermine online or without a prescription. The only way that you can legally get real phentermine is by consulting a licensed and practicing physician and getting a prescription from them. If you want something that can be purchased online without the need for a prescription, then you want dietary supplements. There are lots of great choices out there, and we would have to recommend PhenQ ourselves. It helps to suppress appetite and boost energy, much like phentermine, but with none of the side effects. False! Lots of people hear about phentermine from friends and family and assume that it’s just a “casual” weight loss pill that has barely any side effects. This couldn’t be further from the truth. Phentermine is incredibly addictive, and it also has some other serious potential side effects. These side effects include heart and lung problems, and they typically present as chest pain, fainting, shortness of breath, swelling (edema) in the lungs and feet, or difficulty performing daily activities. If you do experience any of those symptoms, be sure to consult your doctor and immediately call the emergency services. However, many users only experience a minor reaction. The common side effects are dry mouth (xerostomia), trouble sleeping (insomnia), constipation, headache, dizziness, rapid heartbeat, “phen rage” (dysphoria), and libido changes. Check out the links provided above to learn more about these side effects and how to manage them. False! Phentermine should only ever be taken as a short-term weight loss aid. It’s not for long-term use, even on prescription. The FDA has approved the use of the medication for twelve weeks (three months) and that’s the longest possible prescription. The short-term nature of that approval is because it takes such a serious toll on your body, particularly the heart, the addictive nature, and the tendency for users to develop a tolerance. This is why the maximum prescription is around three months. If your doctor believes you may benefit from taking the medication for longer, they may consider prescribing you several rounds of phentermine, often with a break of at least a month between rounds. Whether or not you are prescribed several rounds is up to the discretion of your doctor. They carefully consider your individual needs and assess if it would be beneficial for you or not. False! Phentermine is designed to suppress your appetite and boost energy levels, giving you the chance to change your daily habits and adopt healthier habits. It’s up to you to take advantage of those effects to learn more about eating properly and making healthy and sustainable changes to your diet. The most important thing to do is keep an eye on your food portions. Try to fill up half of your plate with fruits and vegetables, a quarter of the plate with lean proteins, and a quarter of the plate with whole-grain starches. If you have a small appetite, you should also focus on making sure you eat enough. Women should eat at least 1,200 calories, while men should eat at least 1,500 calories. Finally, staying hydrated is important when using phentermine! Getting enough water makes it easier for you to lose weight, process toxins, and maintain a healthy balance. While phentermine can give your weight loss efforts a boost, you still have to stay conscientious of the changes if you’re looking to lose weight and keep it off. False! One of the most common phentermine myths, particularly in forums and support groups, is the idea that you don’t have to exercise while taking phentermine. Outside of any restrictions your doctor or medical team gives you, exercise is an essential and healthy part of losing weight. If you haven’t been doing much exercise lately, then make sure you start out slow. There’s no point in giving it your all right out of the gate, which is just going to increase the risk of injury or getting burned out. Once you start exercising, aim to reach 30-60 minutes of activity every day, including cardio and strength training. If you want some good ideas on getting started, take a look at the articles we have about exercising at home, the gym, with your family, with joint pain, and exercising for fun. False! Many phentermine users are under the impression that they can instantly lose lots of weight and continue losing weight at that rate for as long as they use phentermine. Unfortunately, that idea is neither realistic or accurate. A safe and sustainable rate of weight loss is often considered to be losing one to two pounds of weight per week. Those are just general numbers, so you might lose more or less when using phentermine (particularly at first). Still, it’s likely that the longer you use phentermine, the less effective it will be. Your body builds up a tolerance to phentermine, which manifests as an increase in appetite, less weight loss, or some combination of the two. 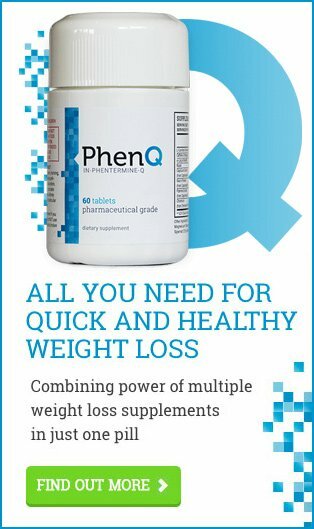 Some people find adding PhenQ boosts weight loss during the latter stages of their phentermine prescription. Still, the decreasing effectiveness of phentermine, combined with the fact it should only be used in the short term, necessitate having to develop healthy habits during your treatment. False! Most people taking phentermine are worried that they will just put the weight back on once they stop taking their medications. While you definitely won’t gain the weight back, it is possible to rebound and put some weight back on if you don’t maintain your healthier new lifestyle. Maintaining weight loss depends upon your own dedication to healthy eating and exercise habits. As phentermine is designed as a short-term prescription and not a long-term weight loss solution, it’s important you don’t rely too much on the medication to make changes for you. Instead, be sure to use the time you spend on phentermine to establish healthy and sustainable eating and exercise habits and be sure to stick to them when the prescription period is over. False! If you could become pregnant, then you should take some kind of contraception while taking phentermine. The weight loss medication is not suited for women that are trying to become pregnant or are pregnant. It’s understandable then, that some women would be worried about how phentermine interacts with birth control pills. Phentermine by itself has not shown to affect how effective birth control pills are, but it has been linked to breakthrough bleeding on occasion. The unusual flow could be related to needing more estrogen while taking phentermine. Qysmia (phentermine and topiramate) can decrease the effectiveness of birth control pills and possibly cause spotting, so be sure to use some back-up contraception such as condoms. No matter what prescription you are, it’s always important to consult your doctor about birth control and phentermine during your initial consultation. This appointment is your chance to talk about any potential problems and concerns you have ahead of time. Similarly, if problems do arise when taking phentermine – or if you notice something unusual – don’t hesitate to talk to your doctor about it! False! As mentioned earlier in the article, phentermine is a powerful medication that shouldn’t be prescribed casually. It’s intended for the short-term treatment of exogenous obesity. It isn’t designed for losing a little bit of extra weight. General guidelines for phentermine suggest prescribing it to people that have a BMI above 30 but are otherwise healthy, or for people who have a BMI over 27 with other risk factors such as high blood pressure or diabetes. Phentermine isn’t recommended for use by people with a normal weight (or those just slightly overweight), or for people that have a history of cardiovascular problems. It certainly isn’t for everyone. Your doctor and pharmacist will check to ensure that you aren’t currently taking contraindicated medication, or are suffering from conditions that rule-out being able to use phentermine. It’s vital that you discuss your entire medical history and all the medications you are taking when discussing phentermine prescription with a doctor. If your doctor is against prescribing phentermine, then they likely have your best interests at heart. It is important to lose weight, of course, but overall health and wellbeing are always going to be their primary concern. Rather, consider trying a prescription-free phentermine alternative. There are several on the market, but PhenQ is one of the best on the market. False! It’s true that phentermine can work wonders, but it’s certainly no miracle pill that can do everything by itself. It takes hard work, dedication, and commitment to lose weight and keep it off. If phentermine is the right choice for you, then you should be sure to take advantage of your time using the medication to develop healthy habits you can stick to. Learn more about making healthier choices during meal times, establish an effective and sustainable workout routine, and make overall improvements to your lifestyle. Phentermine can give you the initial push you need, but whether or not you lose weight is up to you. We hope that we’ve been able to clear up any confusion you might have about phentermine and the myths surrounding it. Do you have any other questions or concerns? If so, don’t hesitate to share them in the comments below! Last updated: September 27th, 2018. Bookmark the permalink. I’m 5’2 around 130 lbs is it ok to take the medication to loose 8-10 lbs. I have high blood pressure and heart rate 80-100. Does phen cause hair loss?